President Francois Hollande said the men claimed to be from so-called Islamic State (IS). The IS-linked Amaq news agency said "two soldiers of the Islamic State" had carried out the attack. French interior ministry spokesman, Pierre-Henri Brandet, said one of the hostages had been critically wounded. He said the hostage-takers had been "neutralised" after coming out of the church. Police were now searching the church for explosives. Police sources said it appeared the attackers had slit the priest's throat with a knife. The area has been cordoned off and police have told people to stay away. Mr Brandet said the investigation into the incident would be led by anti-terrorism prosecutors. One of the men was known to the French intelligence services, French TV channel M6 has reported. French Prime Minister Manuel Valls has expressed his horror at the "barbaric attack". The Archbishop of Rouen, Dominique Lebrun, who was attending a Catholic gathering in Poland, said: "I cry out to God with all men of goodwill. I would invite non-believers to join in the cry. "The Catholic Church cannot take weapons other than those of prayer and brotherhood among men." Observers have pointed out that France and other countries are now moving more quickly towards what is called tactical intervention - overwhelming armed force aimed at minimising the period during which terrorists or armed criminals can threaten the public. 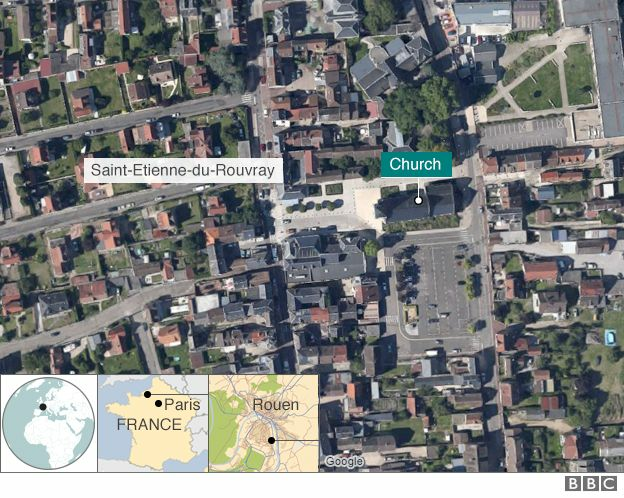 The selection of a church by the attackers, whatever their motives turn out to be, crosses a new red line in the grim history of recent attacks on continental Europe. The murder of an 84-year-old priest in this attack will have further inflamed public opinion. 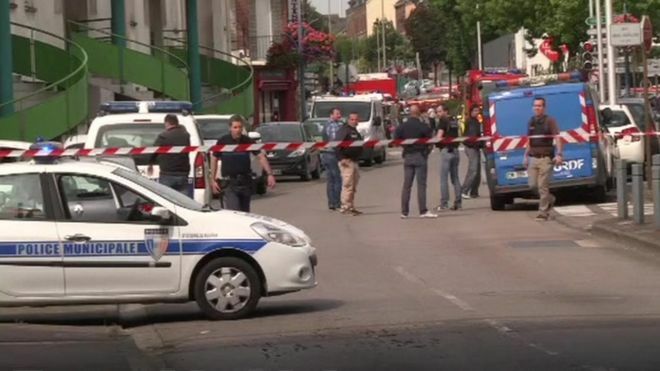 News that one of the attackers was on the French government's terror watch-list, known as the S list, will prompt many to question its purpose if he can remain at large to carry a knife into a church. A woman who works at a local beauty parlour, Eulalie Garcia, said she had known the priest since her childhood. There was no immediate word on the identity of the hostage-takers, but France has been on high alert since the Bastille Day attack in Nice earlier this month, when a man ploughed a lorry into celebrating crowds, killing more than 80 people. The Nice attack was carried out by Tunisian Mohamed Lahouaiej-Bouhlel, who was not a known jihadist but so-called Islamic State said he had acted in response to its calls to target civilians in countries that have been attacking it. The BBC's Lucy Williamson in Paris says the French government has been under huge pressure to prevent further attacks.